When Deaf West Theatre’s production of Spring Awakening begins, two actresses, both playing Wendla, face each other from opposite sides of a mirror that sits center stage. The music starts to play and one Wendla (Katie Boeck) begins singing “Mama Who Bore Me”, accompanying herself on the guitar, while her counterpart (Sandra Mae Frank) begins performing the song in American Sign Language (ASL). Prior to seeing this phenomenal production, I had seen Spring Awakening a combined twelve times, including most of the original Broadway cast, the closing Broadway company, the first and second national tours, and another regional production in Los Angeles a couple of years back. What made Deaf West’s version so incredible is that despite knowing this show like the back of my hand, it felt in many ways as if I was seeing it for the first time. At times I found myself genuinely surprised by the inspired directing choices made by Michael Arden, an accomplished Broadway performer and, clearly, a gifted director. To find new meaning in a show you have known for 7 years and are seeing for the 13th time is a rare occurrence, and one of many reasons why this production has been on my mind practically constantly since seeing it last weekend. 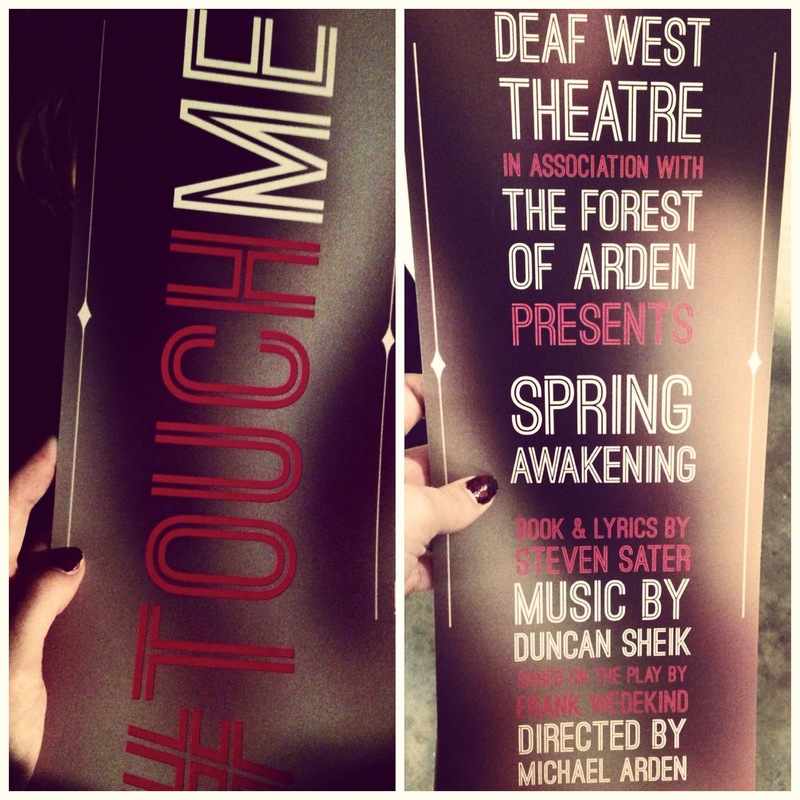 Yes, the Touch Me thing is a door hanger. Deaf West is recognized as the premiere sign language theater in the US, and their mission is to produce plays and musicals that hard-of-hearing and deaf audience members can enjoy. Spring Awakening, which won the Tony Award for Best Musical in 2007, takes place in 1891 Germany and tells the story of a group of young teenagers struggling to communicate with their parents and come to terms with their burgeoning sexuality. In an interview with Theatermania, Arden said his concept is that an epidemic left many members of the small town where the show takes place without hearing, and explores the impact this has on the characters’ lives and the community as a whole. Approximately half the cast of this production is deaf or hard-of-hearing and half is hearing. Whereas Deaf West usually presents productions that are simply also performed in sign language, what sets their Spring Awakening apart is that for the first time it is acknowledged and incorporated into the story that some characters are hearing while others are not. The characters played by deaf actors seem to have been chosen very deliberately: Wendla, Moritz, Ernst, Martha, Thea, Otto, and some of the adult men. In 1891 Germany, deaf children were forbidden from using sign language in school in an effort to force them into oralism. This element makes Moritz’s struggles in school and eventual failure even more heartbreaking. Similarly, when Wendla asks her hearing mother to explain where babies come from, the communication barrier between them adds another devastating layer. It is important to note that all of the actors in the production, not only the deaf and hard-of-hearing actors, also performed in ASL, which was truly impressive. As described in the opening scene, each character played by a deaf actor was paired with another actor who played that character’s “voice”. These “voice” actors also played instruments as part of the onstage band, including guitar, piano, bass, and harp. They performed directly to their counterparts rather than to the audience. In the rare scenes that were only spoken and not signed, the corresponding words were projected onto the walls of the stage. There were also a couple of instances where a scene was performed either only in English or only in ASL to really boost the emotional impact. When Moritz tells his father (who is also deaf) that he failed, the gist of their emotional conversation, although solely in ASL, is immediately understood, and punctuated by the projection of only the word “FAILED”. When Wendla is examined by a doctor, who is one of the only characters in the show not fluent in ASL, he decides shouting at the girl is the best way to communicate, while she looks to her mother in confusion. Despite my deep attachment to it, I have never claimed Spring Awakening to be a perfect show. In particular I have always found the scene in act one where Wendla, desperate to understand her abused friend Martha, asks Melchior to beat her to be problematic. Typically, with the exception of an inspired performance by understudy Eryn Murman on Broadway where she effectively telegraphed the emotions in advance, I do not feel Wendla’s character is developed enough at that point in the story for her actions to make sense. In this production, however, Sandra Mae Frank and Austin McKenzie (Melchior) made the scene work better than I have ever seen it. It was almost as if the added struggle of being deaf in this 1890s society gave Wendla the final something she had always been missing as a character. Moritz’s suicide was also made even more heart-wrenching when his final words were uttered only in ASL, after actor Daniel Durant symbolically took the microphone from his “voice” counterpart (Rustin Cole Sailors), effectively telling him to exit the stage. That scene was perhaps the moment where Arden’s direction gave the most new life. Whereas the stage usually simply goes dark, picking up moments later on Moritz’s funeral, in this version you saw Ilse (Lauren Patten) and Moritz’s father react to finding the body as Durant, bathed in white light, slowly walked away. This production features new choreography by Spencer Liff, who also choreographed the award-winning production of Hedwig and the Angry Inch that is currently on Broadway. Staged at Inner City Arts’ Rosenthal Theater, which has only around 100 seats, the production was incredibly intimate. In many ways, the choreography was built to involve, showcase, and enhance the ASL, while also playing homage to the original Broadway production, in particular with a cute nod to the handheld mics traditionally used in “Totally Fucked.” I particularly loved how they staged “The Mirror Blue Night”, with the cast members wearing little lights strapped to their hands. For the finale, “Song of Purple Summer”, the stage was enveloped in a white curtain that was raised on ropes, allowing the shadows of the signing performers to be magnified. However brilliantly conceived, this production would be nothing in the hands of a lesser ensemble of actors. One thing that struck me was just how young they all seemed. The characters are supposed to be 14-16, and many of these performers truly looked it, which only made the story resonate more. McKenzie played Melchior with the perfect amount of confidence and smartass charm, and had a lovely voice and star quality to boot. Joseph Haro’s Hanschen was as smugly creepy as he needed to be, and his seduction of Ernst (Joshua Castille) gained new dimension as his interaction also with Ernst’s “voice” (Daniel David Stewart) insinuated a bit of a ménage à trois. I also loved that Anna was played by Ali Stroker, who is in a wheelchair and has one fierce voice. I could easily go on all day about how fantastic the entire cast was, and at the end of the performance they received a rousing ovation with not one but two types of applause, as the audience contained both deaf and hearing patrons. This production took one of my favorite shows and re-imagined it in a way that only brought out more layers of beauty and significance. I was moved, inspired, and truly blown away. Unfortunately the remaining performances are all sold out, but I truly hope this production lives on elsewhere so more can experience the magic. For more information on DeafWest and their other upcoming productions, please visit their website.